Info: Cover was done in 4 or 5 versions, with different shades of yellow. Of course it turned out piss yellow!! 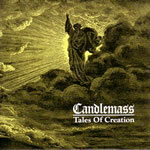 “Tales of Creation” was the mature answer to “Ancient Dreams”. Everything that went wrong the last time had to be right with “Tales..”. 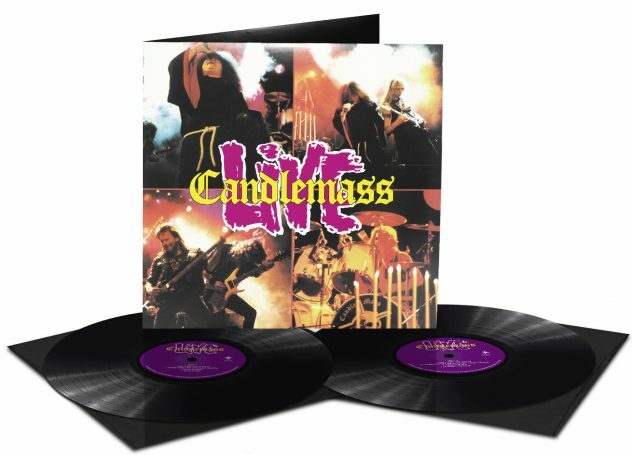 Extensive touring in Europe (with Motörhead, Destruction, Sacred Reich, Coroner among others) and in the states (with Liege Lord) proved that Candlemass was a fierce liveforce to take seriously, but they needed an album to back it up with. Something raw, lively, organic and heavy – as the band itself on stage. Something that could re-establish them as the premier metalband in the world. “Ancient Dreams” was a success in sales terms and the tours were fantastic with crazy and dedicated fans everywhere. 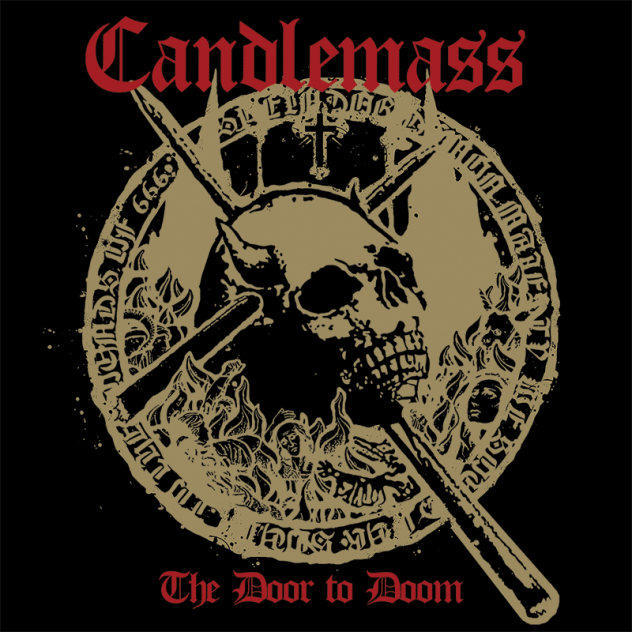 But Candlemass needed to reach the next level, not repeating old formulas. The album that really did it all was entitled “Tales of Creation”. The first on Music for Nations in Europe and the first on Metal Blade in the states. This time Leif Edling dug deep into the drawers and realized he wanted to fulfill an old dream finsish the concept-story “Tales of Creation”. A saga about the origin of life that begun on on their first demo with “Under the oak” (also on Epicus) and “Into the unfathomed tower”. Now he wanted to do the whole thing. The lyrics – almost half a bible – was written back in 1985, had to be reworked a bit and new music had to be created to the concept. The original song “Dark reflections” (on a demo from 1985) was an ultrafast double bassdrum blaster, the new version was a bit slower with a riff guaranteed to get all necks going. Actually, the whole story began on “Ancient Dreams” with “Darkness in paradise”, a lengthy about a soul that is cast out of paradise to seek new hope for mankind. On “Dark reflections” (the opening track/sequel on “Tales..”) this soul is sent down to hell on earth by the gods. He passes through the kingdoms of death, hell and heaven on the quest for peace and harmony, and finds it finally within himself on the last song on Tales – “A tale of creation”. This song took probably the longest time to record. First neither Messiah or Leif could remember the beautiful vocal harmony of the song. That case was solved after late nights in the studio (Stockholm Recording again, and Mats Lindfors again). Second, Lars Johansson also had some difficulty in finding the right mood for his guitar-solo. It was also dealt with after a couple of sweaty evenings/nights in the studio (and what a solo it turned out to be!). Another memorable moment was when mr. Messiah threw the bands englishspeaking manager out of the studio. The midnight session was pretty intense and the manager had the nerve to tell Messiah how to pronounce a word in a “critical” verse. Messiah had been singing for hours and wasn’t in he mood for “uneccesary changes” and the manager ended up on the street outside the studio. The rest of the band had to practise heavy diplomacy for weeks to soften up the pretty pissed off manager. The word? “Dawn”! It was close that the fast track “Into the unfathomed tower” didn’t make it on to tape. Jan Lind normally had no problems with speed. But here Mats Lindfors cut large holes in the bassdrum frontskins to get a good sound. Jans clubs didn’t bounce at all and Jan was totally exhausted after only two takes. In the end Mats Lindfors had to punch the drums in and out between takes as Jan was dying behind the drums and his legs felt like overcooked spaghetti. On this pretty short track there are two or three fat editings on the drums. This was before the era of computers and no drummachines were used, fortunately Mats Lindfors knew his trade and it is absolutely impossible to hear any cuts. The band talked about using the “Manhood” painting by Thomas Cole (the third one) as the cover for “Tale of creation”- to continue the series – but Leif came up with the ultimate cover; Gustave Dor’s spinechilling painting “Let there be light” from his old family bible. The thought was to print in a more reddish colour, then the little trust-no-one-people-are-idiots-ghoule appeared and it came out in a piss-yellow nyance instead. Looks pretty cool anyway. The critics were happier this time, it was only Kerrang!! That complained about the use of “old” material. Yes, some of it was stuff that been on earlier demos and in the mental production-brain (who throws good material away? ), but still “Tales of creation” is a heck of a record; “Somewhere in nowhere”, “A tale of creation”, “Into the”, “Under the oak”, “Dark reflections”, great songs! This record is even used in english classes in a swedish high school according to a very drunk english teacher the band met at a gig. Eeehhhh??? 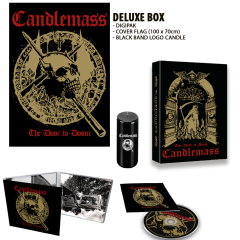 The album release was supported by an extensive european tour starting on october 4 at the London Hammersmith Odeon together with Acid Reign, Dark Angel and Nuclear Assault. 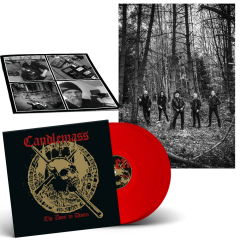 In december Candlemass took off to Greece to play a couple of special headline gigs for a very enthustiastic greek audience. Time for a second round through Europe together with scandinavian friends King Diamond and Savatage from America in february 1990. What a tour!